Bing has included Wikipedia content directly into its index. Besides showing relevant Wikipedia article links in search results, you can also read them directly on Bing search results pages. Enhanced view feature display Bing hosted Wikipedia article pages which are exactly same as original Wikipedia articles (including a link to original Wikipedia article). 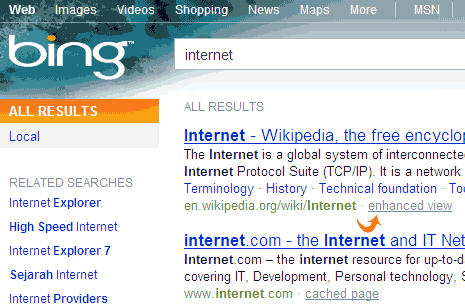 Wikipedia results on Bing search pages have “Enhanced view” link at the bottom. You can click enhanced view link and see that Wikipedia article on Bing itself. Article is exact copy of original Wikipedia article complete with relevant images. 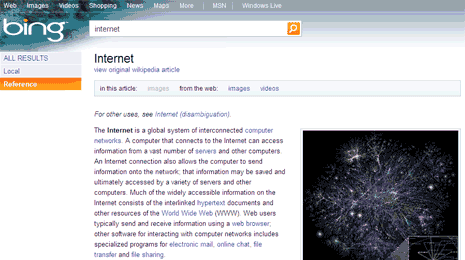 So bump into Bing to access Wikipedia articles directly without having to jump from one window to another, interesting? Nice find davindar but this one accessble only on full version of bing that is in indian version of bing we can’t get enhanced view option fro wikipedia.